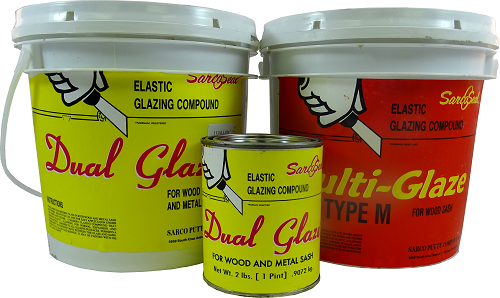 Multi-Glaze Type M Glazing Compound | Abatron, Inc.
Sarco Multi-Glaze Type M is the best traditional knife grade linseed oil glazing compound available for glazing and bedding glass in wood sash and doors. Type M is the quickest surface skinning product and forms a strong surface skin in one week depending on temperatures. It remains elastic and flexible throughout its lifetime. Type M is for inside shop glazing only. Give Type M at least 14 days to cure before painting with oil or latex paint. Q Will this adhere to aluminum frames? Q Can I prime all window sash parts - stiles, rails, and muntins before the application of the glazing? Or do you get better bond strength glazing directly to raw wood and then prime? You should always prime the bare wood before using the glazing compound. Q Can't calcium carbonate or pumice be brushed over the glazing to achieve a fast skin over (in under 24 hours) ? No. The Glazing Compound takes 2-3 weeks to skin over. The window should not be put outside after application of the Type M until it has skinned over. Q I’m reglazing wood windows in 1925 house. Read on many websites “Type M” is best. Here it says only for inside shop use? Is this not suitable for general window glazing (glazing is on outside of window)? Also having a hard time finding a supplier near me. Ones listed don’t sell product I need. Can I buy a quart off your website? Answered by the admin	The Sarco Type M is for indoor use only. It must be applied indoors, allowed to skin over (usually within 14 days) and then you can take the window outside. We only sell the product in a one gallon size.